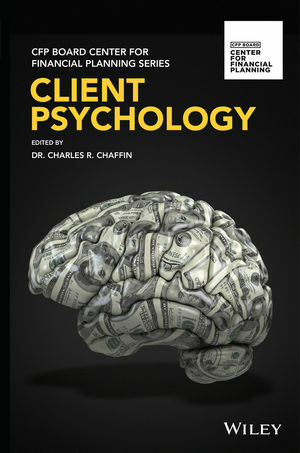 The second in the CFP Board Center for Financial Planning Series, Client Psychology explores the biases, behaviors, and perceptions that impact client decision-making and overall financial well-being. This book, written for practitioners, researchers, and educators, outlines the theory behind many of these areas while also explicitly stating how these related areas directly impact financial planning practice. Additionally, some chapters build an argument based solely upon theory while others will have exclusively practical applications. If you’re a CFP® professional, researcher, financial advisor, or student pursuing a career in financial planning or financial services, this book deserves a prominent spot on your professional bookshelf. CHARLES R. CHAFFIN, ED.D., is Director of Academic Initiatives at the CFP Board Center for Financial Planning. He is Executive Editor of Financial Planning Review, the academic journal from the CFP Board Center for Financial Planning. In addition, he leads the Academic Research Colloquium and the Columbia UniversityCFP Board Teaching Seminar and serves as editor of the CFP Board Center for Financial Planning Series. He is a published researcher with a multitude of papers that focus on the cognitive workload of learners in different task settings, reflective practice, and best practices in higher education curriculum and instruction, both within education as well as within financial planning. He has taught all levels of learners, from elementary school, baccalaureate, graduate, and doctoral studies through a variety of instructional platforms. He holds a graduate degree from the University of Michigan and a doctorate from the University of Illinois at Urbana-Champaign.